When looking at a chest x-ray,one must bear in mind technical factors that might compromise the quality of the film for proper interpretation.The most important technical factors that can negatively impact the quality of a chest x-ray film are inspiration,rotation,and exposure.A good quality film is straight (not rotated).Here is how to know whether a chest x-ray film is rotated or not. 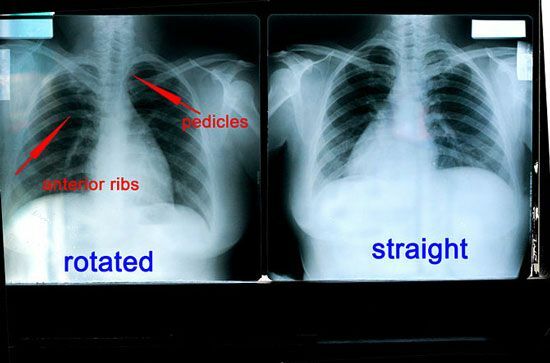 1.Determine whether the anterior ribs are at the same distance away from the pedicles on either side.If so,the film is straight.If not,it is rotated. 2.Determine whether the medial heads of the clavicles are at the same distance away from the midline on both sides.If so,the film is straight.If not,it is rotated. 3.Determine the position of the carina to the right pedicles.If the carina is to the left of the right pedicles,the film is rotated.If they are at the same position,the film is straight. 4.Determine whether one lung is blacker than the other.If so,the film is rotated,or another abnormality is causing difference in aeration between the lungs.If not,the film is straight. 5.Determine whether the ribs are visible posteriorly.If so,the film is rotated.If not,the film is straight.Only the vertebrae should be visible on the lateral view. Previous:Where to buy the reagent of hematology analyzer if I have no any regeant avaliable?